These are the texts which I have chosen to introduce a sermon which is not really a sermon at all. What I have to say to you this morning is only a personal narrative—a little story out of my own life. I have met Gandhi—have clasped his hand, have looked into his eyes, have listened to his voice. I have sat in a great public audience, and heard him speak; I have sat alone at his feet and talked with him about many things. All this is of no importance, except to myself. But I have talked to you so often about the Mahatma, and you have responded so generously to admiration and love for this great man whom we have learned together to describe as “the greatest man in the world,” that I feel I should be remiss in my duty if I did not share with you, so far as I am able, an experience which I shall ever regard as the most precious of my life. Furthermore, there are wider implications in my experience! I saw Gandhi at the climactic hour of his career, and against the background of events momentous in the history not only of our own but of all time. I can tell you, not only of my impressions of the man, but also of my estimate of his significance today for India, the Empire, and the world. I have met, in other words, not merely an individual, but a cause, a movement, a revolution. How do I feel about this phenomenon—this Word become flesh which dwells among us “full of grace and truth”—this incarnation of the Spirit in which is life, and this life “the light of men”? I was in Berlin when I heard that Gandhi was coming to London. Earlier in the summer I had received from him a letter in which he had spoken of his journey, and of his expectation of seeing me on his arrival. But his plans had been thrown into confusion, and he had announced that he would not attend the Round Table Conference. Then came the agreement with the Viceroy, and the sudden determination to make the trip. The moment I heard that Gandhi was coming, that he had actually taken ship and was on the sea, I abandoned all my other arrangements and rushed to London, resolved to camp upon the Mahatma’s threshold until the door might open and let me through. I had not dared to hope that I could greet him when first he landed upon English soil. But by a dramatic and amusing combination of circumstances, which is a story in itself, I found myself on the morning of Saturday, September 12th, standing on the pier at Folkstone awaiting the arrival of the Channel steamer. It was typical English weather—cold and foggy, with occasional heavy showers. The wind was sweeping the waves with white-caps, and chilling the bones of the watchers on the pier. 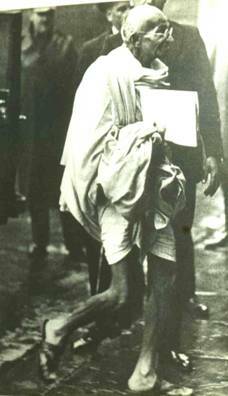 I was talking with an officer, one of the members of the police force appointed to be the body-guard of the Mahatma. To conquer England! I thought of that great soldier of ancient Rome and of his victories upon these shores. His Twentieth Legion had remained here three hundred years! Then I thought of another conqueror—William of Normandy—who had crossed this Channel a thousand years after the immortal Julius, and beaten the Saxons and annexed their realm. This invader had landed at Peveny, not so many miles here to the south. And now another thousand years had passed, and still another conqueror was crossing these stormy seas. Not a soldier, but mightier than any soldier. Not an invader, with a sword of steel, but an apostle with the sword of the spirit. Not an enemy to lay waste the land, but a friend to surprise and devastate the hearts of Englishmen. If ever Britain was in peril, it was in peril now, when for the third time in two thousand years, there was coming an alien to dictate terms of peace. I wiped the rain from my glasses, and gazed out through the mist to the open sea. There was the steamer, a little craft in white, emerging from the horizon like a sheeted ghost. As she made fast at the pier, only one man, the official representative of the British government, was allowed on board. All the rest of us—friends of Gandhi, delegates from India, the Dean of Canterbury, newspaper reporters and photographers—were left standing in the rain, with a great crowd of sightseers behind the barriers. But the delay was brief. In a few moments we were aboard the ship, and I was standing at the door of Gandhi’s cabin awaiting my turn to be received. It was here I had my first glimpse of the Mahatma. 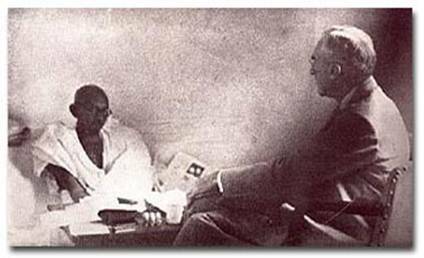 He was sitting cross-legged upon his berth, in earnest conversation with Reginald Reynolds, a young English Quaker who had been a resident at the Ashram in India, and had become famous as the bearer of Gandhi’s letter to the Viceroy on the eve of the march to Dandi. Gandhi’s legs were bare, his body wrapt to the neck in the ample folds of a Khaddar shawl. His head and shoulders were bent forward in a listening attitude. A naked arm, long and lean and wiry, reached out of the shawl and took a paper from Reynold’s hand. There was a quick interchange of words, a flitting smile, and the conference was over. It was now my turn. I stepped into the little cabin. Instantly, Gandhi jumped to his feet, and, with the lithe, quick step of a school-boy, came forward to greet me. I felt his hands take mine in a grasp as firm as that of an athlete. I saw his eyes shining with a light so bright that not even the thick glass of his rude spectacles could obscure their radiance. I heard his voice addressing me in tones as rich and full as they were gentle. We had a few precious moments together. I was confused and excited, and today have little memory of what was said. But at this first meeting it was not words but feelings that were important. I was in the presence of the man whose spirit had reached me, years before, across the continents and seas of half the world, and now this presence was stamping its indelible impression upon my mind. In a few moments we were off the boat, and started for London. Gandhi was in the official automobile of the government, guarded by police. I rode in a compartment of the train with Devidas Gandhi, the Mahatma’s son, Mr. Pyarelal, one of his secretaries, and Miss Madeleine Slade, the English girl, now known as Mirabai, his servant and disciple. The story of Miss Slade is one of the noblest chapters in the saga of the Mahatma. Years ago, before the War, she was an English society girl, daughter of a British admiral, young, beautiful, rich, much sought-after. During the War she did relief work with the Red Cross in the usual conventional way. After the War she found, as so many found, that something had gone out of her life. She seemed to have lost her grip upon reality. A sense of frustration and futility settled down upon her like an atmosphere. It was while she was groping about, like a person lost in a dark room, that she hit by chance upon a book by Romain Rolland, the one man in our western world whose soul is most akin to Gandhi’s. She went to Switzerland to see Rolland, and through this contact made her first acquaintanceship with the author’s biography of the Mahatma, published in 1924. She had no sooner read the pages of this book, than she realized that she had found the mission of her life. She wrote to Gandhi, and asked if she might come to the Ashram and be his servant. The Mahatma did not encourage her. Did she know what she was asking? Did she realize what it meant to leave England and come to India? How could he be sure that she was sincere, had thought through her problem, and had steadfastness of purpose to work it out? She had better wait a year, and then write him again. 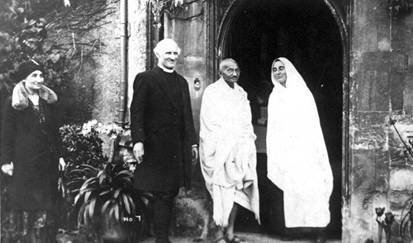 Gandhi with Madeline ”Mirabai“ Slade. At once Miss Slade set herself to the task of preparation. She abandoned her family and friends. She got rid of her dresses, her jewels, and all the paraphernalia of her social life. She arrayed herself in rough garments, did menial work, slept on the floor. She made herself a vegetarian. She saturated herself in the Bhagavat-Gita, which was the Hindu scriptures, and Gandhi’s Bible. The year up, she wrote Gandhi again, and told her tale of discipline. He now said she might come—and from that day to this, she has been his servant, his nurse, his friend, his fond disciple. She prepares his food, washes his clothes, makes his bed, cleans his room. She guards his hours of prayer, and stands sentinel at his day of silence. She follows his footsteps during the hours of the day, and sleeps upon his threshold during the hours of the night. I thought, as I looked at her, how beautiful she must have been, with her noble figure, her lustrous eyes, her liquid voice. I looked again, and thought how beautiful she is now, in spite of her shaven head, her rough clothing and her rougher hands, for her beauty, like Gandhi’s, is the toward beauty of the spirit. I looked still again, and found myself thinking of the women who followed Jesus—Martha, Mary, the other Mary—and who served him with their love. I thought of St. Francis and the Lady Clara, and all the lovely relations between these two through the years of life and in the hour of death. And I said to myself, this Mirabai is the Mahatma’s Sister Clare. She is a combination of Martha, “careful about many things” for Jesus, and Mary, who sat quietly and gladly at the Master’s feet. 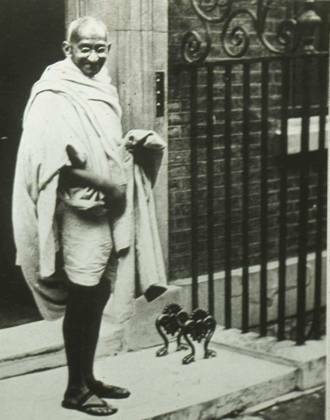 We were soon in London, and went immediately through the mud and rain to the Friends Meeting House, where a great audience had gathered to meet and welcome Gandhi. As I saw him enter this auditorium, I was impressed again by the beauty of his personality, and now, also, by its power. With what dignity he walked upon this platform; with what serenity he surveyed this English scene; with what command he took possession of these men and women! To an intruder who knew nothing of Gandhi, nor of the momentous character of the occasion, there might have been something ridiculous in the picture. Here was this Indian striding into the room with his feet bare, his legs naked to the thighs, his middle bound by the loin-cloth, his body wrapped and rewrapped in the ample folds of his Khaddar shawl. But as he took his seat, and sat there calm and motionless as Buddha, the ridiculous, if it ever was present, was straightway diffused and dissolved into the sublime. I shall never forget the sense of awe that settled like an atmosphere upon that room. For the first time I understood the secret of Gandhi’s influence over the millions of his fellow-country-men. Had a king been present, we could not have felt more reverence in his presence. Suddenly I found myself remembering the testimony of Mr. Bernay, a sensitive English journalist, who said, “The moment you see Gandhi, you catch the atmosphere of royalty.” And I remembered also that, a few weeks before, I had been in the presence of royalty. I had seen and talked with the man who, for more than thirty years, had been the most brilliant monarch of his day. This man was nobly dressed, attended by his court, himself a fascinating, gracious, and splendid figure. But not all the majesty of this king could match the royal air of Gandhi. But Gandhi not only looked like a king, he spoke like a king. His words that afternoon were gently uttered, in a voice quiet, almost monotonous. But as they reached our ears, they were the words of a royal proclamation. He made three points clear, First, his credentials! He came to England, he said, not as an individual, but as the representative of his people. “I represent, without any fear of contradiction, the dumb, semi-starved millions of India.” Secondly, his mandate! He came not to dicker or to bargain with Britain, but to present the terms of the All-India Congress. “As an agent holding a power of attorney from the Congress,” he said, “I shall have my limitations. I have to conduct myself within the four corners of the mandate I have received from the Congress. . . If I am to be loyal to the trust which has been put In me, I must not go outside that mandate.” Lastly, his goal! What did the mandate exact? “Freedom,” said Gandhi. “The Congress wants freedom unadulterated for these dumb and semi-starved millions.” No compromise here, no equivocation! “He spake as one having authority”—and with the voice of prophecy. I next saw Gandhi on Sunday night at a religious service in which his friends and some men and women from the neighborhood participated. The Mahatma sat on the platform, not in a chair but on the floor, wrapped in a shawl, with a rug thrown about his bare legs. He spoke to us, from his sitting posture, on prayer, his experience of prayer. He stated that he believed in God, and therefore of course prayed. He told us what prayer had done for him. “Without prayer,” he said, “I could do nothing.” As he went on in his quiet way, telling us of his experience with this most intimate discipline of the spiritual life, his voice became very soft and low. I doubt if many persons in the room, back of the front row where I was sitting, could hear what he was saying. The Mahatma seemed more and more to sink into himself. His address became a process of self -communion, or communion, right there before our eyes, with One greater than ourselves. But Words were not necessary at such an hour! Gandhi’s presence was diffusing an atmosphere in the little room which gripped us in its spell. It was a moment of mystic uplift never to be forgotten. I did not see Gandhi again until Wednesday night, when I sat with him in his room during his supper-hour. He was sitting on his bed, on the floor. I squatted down beside him, that I might be as near to him as possible. He held in his left hand a cup of goat’s milk. On his lap was a tin plate such as I have seen convicts use in a prison, and in this was the handful of dates which made the substance of his meal. Gandhi’s secretary, Mr. Pyarelal, was with us but did not join in the conversation. Well, this is my story of meeting Gandhi—a simple story, of little interest, I should imagine, to anybody but myself. But there are elements in it of wider range than the limits of my own personal experience. I have met a man who is more than a man—a great historic figure, of supreme importance for our own and all future time. What is the permanent impression that I gathered of his qualities, and of the relation of these qualities to the world crisis in which they are acting as decisive factors? First of all, may I say that Gandhi fulfilled, and more than fulfilled, all the expectations that I had gathered of him through years of study and inquiry. He was the man I expected to see. I can say of him what the Queen of Sheba said to Solomon in our text, “It was a true report that I heard in mine own land of thy acts and of thy wisdom. Howbeit . . . the half was not told me.” Immediately apparent was the charm of the man—a charm which is irresistible to all who meet him, friend and foe alike. I doubt if anybody can come into the radiance of that presence, and not feel himself melting like snow beneath an April sun. But charm, of course, is no mere surface quality. It reaches deep into the soul. It is like a blossom, all fragrance and beauty, which draws its sustenance from the soil of mother earth. 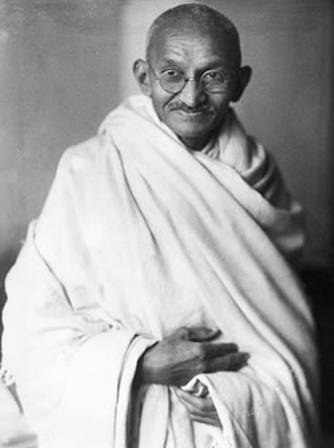 Gandhi has charm without, because within he has infinite resources of gentleness, tenderness, and sweet compassion. This man is animated by love—a love which reaches out to all the world and includes every humblest creature within its embrace. His courtesy is exquisite because his love is instant. He is the living incarnation of a soul at peace with all its fellows. All this, of course, I expected to find. The charm of Gandhi’s person, radiating from the love of Gandhi’s heart, has become the commonplace of every report of the man that has been written. But there are other qualities which are not so apparent—qualities which surprised me as elements of character and influence that I had not anticipated. First, I would mention his extraordinary physical stamina. As an ascetic he is frail, yet he has powers of resistance and endurance that are remarkable. I feared for him the chill blasts of England’s rainy weather beating upon an ill-protected body which had just come from India’s heat. But Gandhi seemed to suffer not at all from exposure, and was the one person who worried not at all. Then there is his capacity to bear up through hours of uninterrupted labor. At four o’clock in the morning, he rises for an hour of solitary prayer. Then comes a rapid walk through the silent streets in the early morning, followed by breakfast, conferences with his secretaries, and interviews. At ten o’clock he speeds to the Round Table, where he is busy all day long with meetings and discussion. At seven o’clock, he conducts his evening prayers with his family and friends. Then come interviews and conferences, lasting frequently into the late hours of the night. Interspersed are his letters, his spinning, and other regular activities. How does Gandhi survive the routine of a day which frequently runs to nineteen and twenty hours in duration? Is it because of his hours of daily prayer? Is it because of his day of silence on every Monday? Is it because of his rigid diet, which sustains his body and does not interfere with his mind? Answer these questions as you will, the fact remains that the Mahatma is a marvel of physical power. A newspaper correspondent recently wrote that he was “showing signs of strain.” I do not believe it! Gandhi has long since delivered himself from the strain which breaks so many of us down. Secondly, I would mention Gandhi’s mental power. More than once I have declared that the great Indian was not remarkable in the field of the intellect. I was tempted to this conclusion, imagine, because of the traditional difficulty of associating intellectual power with spiritual sanctity. Also, I was misled by the absence in Gandhi of that literary genius which was so extraordinary, for example, in Leo Tolstoi. But now I know that Gandhi, like Tolstoi, has a great intellect, even though it does not express itself in large works of the creative imagination. Indeed, I have seldom met such clarity of mind, such precision of thought, such instant and full control of the data of a problem, as I met in Gandhi. His knowledge of India and England, and of many other subjects of the first importance, is exhaustive; his use of this knowledge, in the presentation of ideas and the formulation of policies, is exhaustive to those who must compete with him. In the House of Commons he addressed the assembled members of the Labor Party. For two hours after his speech, he was questioned relentlessly by these friendly but eager men. Like a stag at bay, he was harried by the hounds. But not once did he falter, least of all succumb. He was a match for them all, and at the end, in generous recognition of his victory in the battle of wits, was cheered to the echo by these stolid Englishmen. Be not deceived, my friends! The Mahatma is as competent intellectually as he is devoted spiritually. In his leadership of India, he is the rival of any statesman in the world today. Lastly, may I speak of Gandhi’s sense of humor, his light-heartedness, his capacity for joy. Never have I seen a great man who can laugh so quickly and so heartily. At the slightest excuse, his merriment ripples like that of a little child. This is what makes his smile so potent—it comes not as a sudden and unexpected disclosure, but abides like an atmosphere of warmth and light. To me this happiness was at first disconcerting. How could this man, weighted down by the burdens of his country, faced at this moment by the greatest crisis in the Empire’s history, with millions the world around waiting upon his every word and act, how could he abandon himself so utterly to the enjoyment of an amusing story or a grotesque incident? It seemed uncanny that he could laugh so heartily amid events so momentous. Yet, as I thought about it, I seemed to understand. His merriment is a kind of doorway that opens straight to the secret places of Gandhi’s soul. Why shouldn’t he laugh—this man who is a Mahatma? Thus Gandhi is free from all the myriad cares of the worldly life. He is beset by none of the worries which weigh down other men. He does not have to think of the next meal. He has no clothes nor adornments to bother him. He handles no money, and thus has none to lose. He owns no property, and therefore cannot be robbed. He is delivered, in other words, of all the cares that attach to the accumulation of the perishable things of earth. He has not laid up for himself “treasure upon earth where moth and rust doth corrupt, and where thieves break through and steal”; but his treasures he has laid up “in heaven, where neither moth nor rust doth corrupt, and where thieves do not break through nor steal.” His mind is easy because his heart is free. But more important than this is the fact that the Mahatma is a man who trusts in God. Strange as it may seem to us westerners, with our materialistic modes of thought, Gandhi actually believes that he has found God in his prayers, and walks with him in his actions. It is his conviction that God’s will is manifest to those who seek him, and that this will may be done by those who love him. It is the doing of the will which is the great thing in Gandhi’s eyes. What the consequences may be he leaves contentedly and confidently to Him who rules. In this Gandhi is faithful to his Hindu scriptures. For in the Bhagavat-Gita it is taught that the one concern of men is work, and that the fruitage of this work is in the hands of God. So Gandhi never worries, but only trusts. His confidence in eternity makes possible his happiness in time.